DREAM Technical Academy will be hosting an open house on Thursday, April 17th from 3:30-5:30pm. 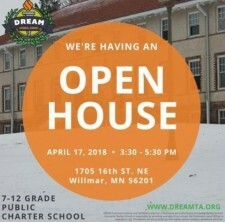 DREAM is a 7th-12th grade tuition-free public, charter school located at 1705 16th Street NE in Willmar on the MinnWest Technology Campus. DREAM’s vision is to provide a project-based learning experience built on relationships where student passions and interests drive learning toward becoming flexible problem solvers, effective leaders and responsible citizens. Here’s your chance to come check out the school! Applications for the 2018-2019 school year are being accepted now as well.